Do you feel like you’re running on empty? Has your brain power been left depleted from the holidays? Are you ready for a cinematic recharge – a jump-start to your internal battery? There’s no better way to get those brain neurons firing again than making them work through a mystery. 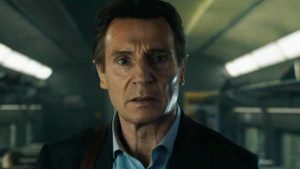 Leave it to Director Jaume Collet-Serra and beloved action movie hero Liam Neeson to deliver decent thrills with THE COMMUTER. Hitchcockian in the most basic of constructs and modestly suspenseful in the right spots, the material blessedly allows for Neeson to Neeson the sh*t outta sticky situations. And it has the random audacity to put the audience’s knowledge of classic literature to the test. Insurance salesman/ family man Michael MacCauley (Neeson) has been living a mundane existence after quitting his job as an NYPD detective ten years ago. Every day, he wakes up, gets dressed, spends breakfast book-clubbing with his son Danny (Dean-Charles Chapman), and then his wife Karen (Elizabeth McGovern) whisks him away to the train station for his commute into the city. They even have a secret shtick for their goodbyes. But his daily routine is about to be shaken up. After he loses his job, a mysterious woman (Vera Farmiga) approaches him on the train home and blackmails him, demanding he kill a murder witness named “Prynne” before the last stop. As he works against a ticking clock of sorts, he unsuspectingly gets caught up in a scheme that has life or death consequences for a few of the train’s passengers. However, what the criminals didn’t suspect (and maybe the screenwriters either) is that our capable hero has a latent set of skills to defeat the baddies. It’s just too bad we don’t see these in full bloom by film’s end. Liam Neeson in THE COMMUTER. Courtesy of Lionsgate. The script from Byron Willinger, Philip de Blasi and Ryan Engle, all working from a story by Willinger and de Blasi, goes above and beyond a stereotypical action-thriller when it sets up its stakes. That’s not necessarily a good thing. You can almost hear the actors blowing dust off socioeconomic sentiments and umbrage towards the financial fallout. It’s a worthy statement, but it’s also about five years too late, and a smidge sloppy in its packaging. Despite Michael being physically fit to tussle like a pro, it’s a little hard to believe his sleuthing skills are so rusty [‘How rusty are they? !’] that his eye for spotting the smallest of details is essentially obsolete. Plus, not only does this stray into reductive territory as this is basically NON-STOP on a train, the third act careens off the rails, morphing the picture into something much more generic than was originally offered. That said, there’s enough here to make this entertaining enough. The opening montage utilizes a brilliant time passage technique, elegantly and efficiently cutting to different parts of the same morning routine. Collet-Serra establishes all the locations on the train in a fluid, logical manner. You’re never confused as to where you are – and who is sitting where. Red herrings – like punk passenger Gwen (a woefully underutilized Florence Pugh) and nurse Eva (Clara Lago) – are dispersed at the precise moment to distract you from figuring out the mystery too soon. Collet-Serra diverts the audience’s attention with Neeson’s fight scenes, like a shiny object for magpies. There’s also a palm-sweat inducing “get out from under the moving train” sequence that, yes, is completely CGI-laden, but still thoroughly taut. While mediocrity isn’t exactly what a film should ever strive for, this one achieves it in a respectable, uncomplicated manner. It may punch your ticket, but the train arrives a little late to the station. 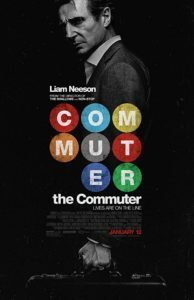 THE COMMUTER opens on January 12. Movie Review: ‘PROUD MARY’ – Mary, Mary. Why you buggin’?